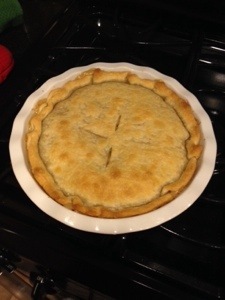 I randomly was craving a pot pie this week and what better time for it than Snowmageddon 2014! It’s cold outside and this was just what the doctor ordered. Get out all of your ingredients and measuring cups – line up on your clean counter top! Once the butter is foamy, add in the dried onion. Whisk constantly to keep from burning. 1 minute or until turning golden. Add in flour and whisk frequently for about 3 minutes, or until golden. You want that roux to get a nutty flavor! 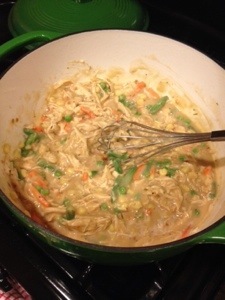 Add in the milk & broth mixture. Whisk to combine and keep whisking frequently to keep from burning and from a layer of film forming on top. When it starts to thicken, add in the thyme, sherry, salt and pepper. When it is a good thickness (sticks to your spoon like gravy, but not too thick), taste it for any adjustments. Should be mmmmm. Stir in chicken and vegetable. Let cook for a minute or two while you are prepping your crust. Roll out the first pie crust on on the bottom of the dish. Don’t let any of that delicious crust go to waste! Ignore the directions to TRIM – boo! Poke with fork in a few places and on the side (optional). Let extra crust lay over the sides of the pie pan for now. Go back and taste your filling mixture. Add a little more salt if needed. Put pie filling into pie pan over the bottom crust layer. 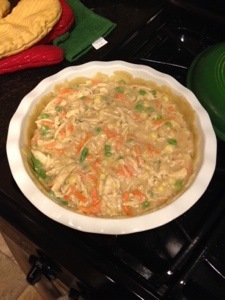 Top with the second pie crust. Tuck the edges under all the way around, it doesn’t have to be perfect. Cut four slices in the top of the pie crust as directed on the box. Bake for 20-30 minutes, or under golden brown and bubbling. (I only cooked for 20 mins on 400 with convection on). Let sit for 5 minutes, serve! Enjoy! Remove from Oven & Tent with Foil. Let rest for 10 minutes. Slice at a 45 degree angle, against the grain (against the tendon fibers). The fibers normally run longways down the meat. I’ll follow up with pictures and “tweaking” after I make this tonight! I love cooks illustrated. It never fails me. Last night was no exception. This one is going to become a regular in the rotation. -Bloomed dried onion flakes & garlic powder in the microwave with 3tsp of EVOO for 30 seconds instead of sauteeing. -For the sauce, I used 1/4 C Ketchup + 1/4 C Chili Garlic Sauce (looks like sirracha in a jar with pepper flakes). 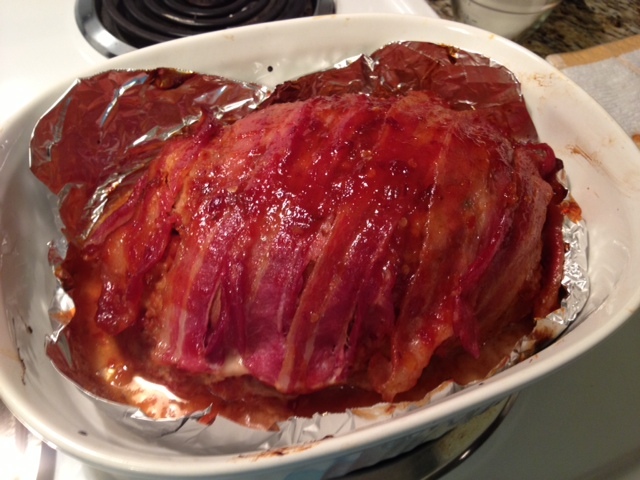 -Cooked for 1 hr 15 mins (to 165 degrees per my meat thermometer). -Served with salad & mashed potatoes! 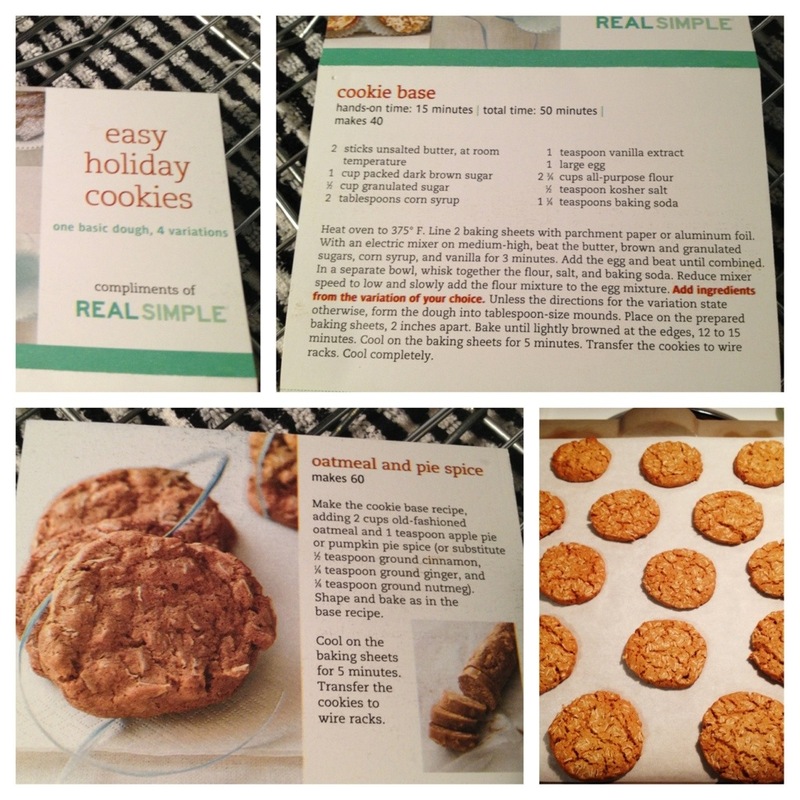 Many of you know that I am obsessed with RealSimple. I love their magazine, website and the little things they send me in the mail from time to time. A few weeks ago, I got a letter that had 4 different cookie recipes all using the same “cookie base”. I made the oatmeal pumpkin pie spice cookies! For these, I made the dough yesterday, rolled it into logs, wrapped in wax paper and put in the fridge overnight. Today, all I had to do was cut, bake and enjoy!! Note: I recommend under cooking these a bit. Oatmeal cookies seem to inevitably be crunchier than other cookies after they cool, even when they don’t look brown! 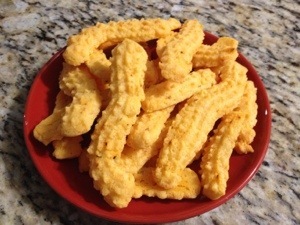 Kirk and I LOVE cheese straws 🙂 I came across Smitten Kitchen’s blog post yesterday and decided I needed to give it a go. This is a great staple for all the Christmas parties going on right now! Results? Ah-mazing!! The recipe was relatively easy to follow and the straws turned out super delicious. I used a cookie gun (with star insert) instead of rolling the dough out like the recipe called for. If you have one, the gun makes it 10x faster and you can avoid the extra cleanup of the counter and your rolling pin. 2. In a food processor, combine the cheese, butter, flour, salt and red pepper in five 5-second pulses until the mixture resembles coarse crumbs (don’t use pulse button, use regular button – works much better). Add the half-and-half and process until the dough forms a ball, about 10 seconds. 3A. If using a cookie gun – fill dough into gun using a spoon and start piping away! 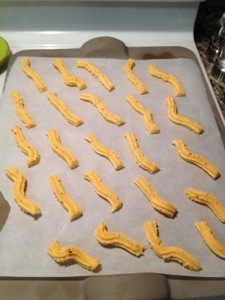 With the cookie sheet turned long ways, make 4-5 long strips of cheese straws. Using a pastry cutter, pizza cutter or knife, cut into 3″ portions. Turn all straws 45 degrees to the left so they aren’t touching. 3B. If rolling out – On a lightly floured surface, using a lightly floured rolling pin, roll the dough into an 8- by 10-inch rectangle that is 1/8-inch thick. With a sharp knife (or a pizza or pastry wheel; both worked great), cut the dough into thin 8-inch strips, each 1/4- to 1/3-inch wide (dipping the knife in flour after every few inches ensures a clean cut). Gently transfer the strips to an ungreased cookie sheet (though I lined mine with parchment), leaving at least 1/4-inch between them. The dough may sag or may break occasionally in the transfer, but don’t be concerned — just do your best. The straws can be any length, from 2 to 10 inches. To bake, I did one batch on my baking stone and another using regular cookie sheets. The ones on the cookie sheets came out crunchier and spicer. Next time, I’ll only use the cookie sheets. I used parchment paper to line the sheets, highly recommended! If you use the cookie gun, make super long squiggle lines and then go back and cut them to your desired length. Mine were about 3″ inches each. I’m not sure if it makes a difference if you use pre-shredded cheese or blocks. 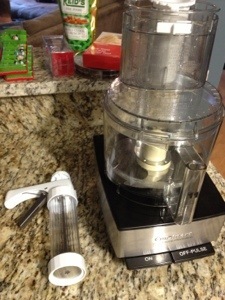 I shredded a block in the food processor using the shred blade and the cheese was great to work with. I have found that in many recipes pre-shredded cheese doesn’t blend as well. 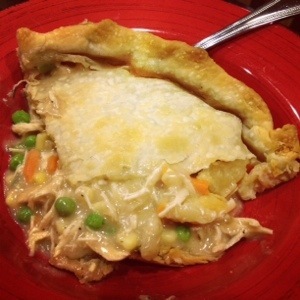 This recipe was created one night when we were running low on groceries and I didn’t feel like going to the store – and now it is one of our favorites! You can even make it all using only one pot 🙂 I highly recommend using a dutch oven or a non-stick pot if you can. · Any other leftover things you want to throw in.. Step 1 – Cook Spinach: Heat large burner to medium, preheat your pan. Melt 1 TBSP butter and add fresh spinach. Stir to combine. Add ¼ cup water and cover. Stir every few minutes to make sure the spinach is cooking down. Once wilted, press spinach on side of pot to separate out water. Drain and place spinach on cutting board. Quickly rinse pot and return to stove for re-heating (still over medium). Step 2 – Cook Turkey: Add turkey to pot and mash with your wooden spoon to crumble. Cover with lid to cook faster. While cooking, chop spinach finely. Add to casserole dish and cover with foil. Return to stir turkey every few minutes until there is no more pink. Drain all liquid from pan into container (do not pour into your drain or directly into trash – HOT). Add taco seasoning and ¾ cup water, stir to combine. Cook/thicken until all water is gone. Pour turkey meat into casserole dish and cover with foil. Step 3 – Make Roux / Cheese Sauce: Quickly rinse out pot (doesn’t have to be completely clean, all going in the same dish), return to stove (still over medium). Add 2 TBSP butter, melt. Once bubbling, add 2 TBSP flour and quickly combine. Cook until flour is browned, about 1 minute or so. Add milk (min 1 cup, increase by ½ cup for more sauciness) and stir to combine. Stir relatively frequently, sauce will thicken (about 5 minutes). You have now made the roux! It doesn’t have to be super thick, just enough to coat the back of a spoon. Add your cheese (you can choose how cheesy or what kinds of cheese, I normally use whatever I have leftover). Stir to combine. Add green chiles and any other vegetables or beans you have (I added a half can of black beans I had leftover last time). Taste and season with salt & pepper, if you’d like. Remember that you’ll have the taco seasoning for flavor too. Step 6 – SERVE Immediately! 🙂 If you’d like it hotter, you can certainly bake it too. Tip, it tastes great with some Cholula on the side! After much research and a few years of cooking under my belt, I have decided that the best “cookware set” is a compilation of pots of different brands. There are a few staples that are a must. There are three types of cookware that I use: Cast Iron, Non-Stick and Stainless Steel. Below I have listed the specific kinds that I have in my kitchen – I fully recommend all of them! There are plenty of great pots/pans out there though, so it all depends on what type of cooking you do most! I most frequently use http://www.amazon.com for reading reviews. o Best Uses: Browning Meat, Boiling Noodles & Vegetables, Soups/Stews, Making 1 Pot Dishes & Finishing in Oven to Brown (i.e. Macaroni & Cheese, Casseroles, etc. ), Roasting Whole Chicken, Deep Frying, etc. o Best Uses: Indoor Burgers, Panini’s (use with cast iron press), Kebobs, Bacon, Grilling Meats (won’t brown the same as in non-stick or cast iron). o Best Uses: Everyday cooking set for all other purposes. These can start on the stovetop and go into the oven (like cast iron)! These brown meat better than non-stick or enamel coated and heat quickly. The chef’s pan/sauté pan is the most important because of the flat sides – you can do a sauce, sauté, pan fry, etc. Use the big pot for boiling or for soups, especially ones that require an immersion blender. These are just the ones that work best for me! If you have any recommendations, please leave in the comments section or email me and I’ll add it to the post! 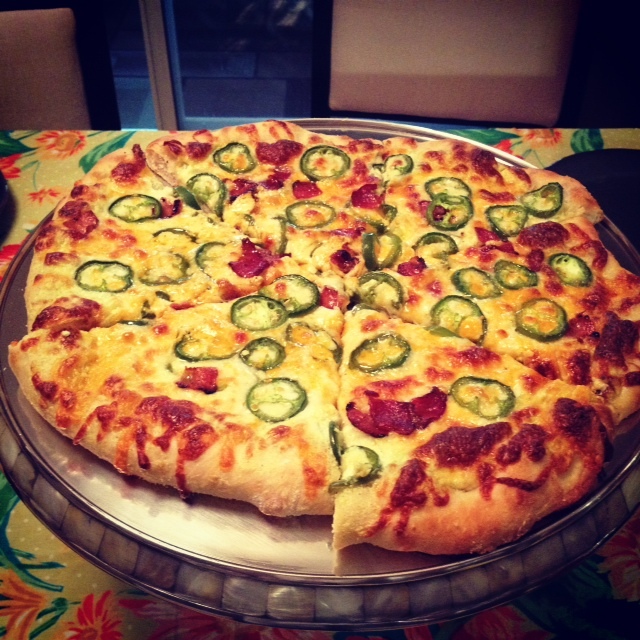 Kirk recently stumbled upon a recipe for Jalapeno Popper Pizza on one of his favorite food blogs and posted it on my facebook page requesting an early birthday feast. Light bulb! Perfect time to try out the recipe for New York-Style crust. Steps for the whole process: Feel free to substitute where needed. 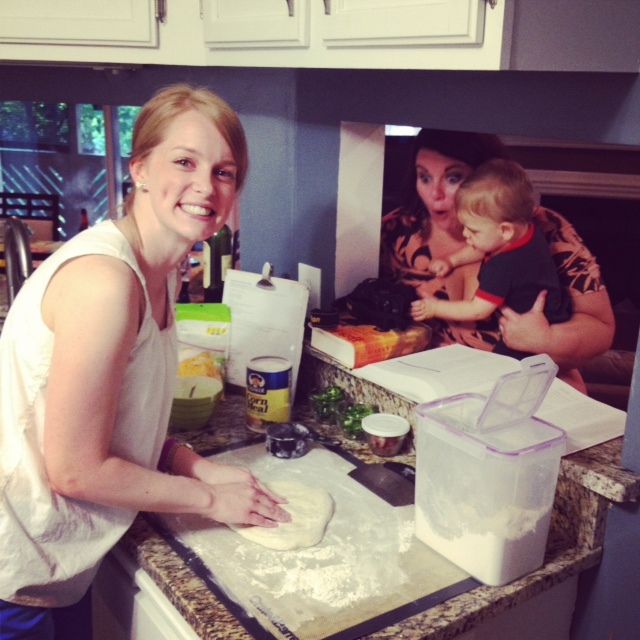 Start pizza dough at least 24 hours in advance (required to sit overnight). In a large food processor fitted with a dough blade – pulse flour, sugar and yeast until combined, about 5 pulses. With food processor running, slowly add water; process until dough is just combined and do dry flour remains, about 10 seconds. Be prepared to add 1 or 2 TBSP of extra water if needed. Let dough sit for 10 minutes. Add oil and salt to dough and process until dough forms satiny, sticky ball that clears the sides of the bowl (30 to 60 seconds). Transfer dough to lightly oiled counter and knead BRIEFLY by hand until smooth, about 1 minute. Shape dough into tight ball and place in large, lightly oiled bowl; cover bowl tightly with plastic wrap and refrigerate for a least 24 hours, or up to 3 days. Cut the bacon and cook until crispy. Store in air-tight container or ziplock. If you are shredding your own cheese, you can also do that ahead of time! I shredded a huge block of cheddar using my food processor shredding blade. 30 seconds, voila! One hour before baking, adjust the oven rack to the upper-middle position (4-5 inches from broiler), place baking stone in oven and heat oven to 500 degrees. This was too hot for my stone (smoked out my kitchen), so I turned it down to 450. Still worked! Take the pizza dough out of the fridge. Transfer dough to clean counter and divide in half. With cupped palms, form each half into a smooth, tight ball. Place balls of dough on a lightly greased baking sheet, spacing at least 3″ apart. Cover loosely with greased plastic wrap and let sit for 1 hour. Take jalapeno ranch and cream cheese out of the fridge. Measure out 15 tbsp of ranch (~ a little less than 1 cup) and then put in the whole block of cream cheese (slightly broken into chunks) into your blender or mini food processor. Blend on high or pulse. Put back in fridge until ready to assemble pizza. Chop jalapenos and set aside (remove seeds, will still be plenty hot). Once the dough has been out for an hour (or anytime after when you are ready), prep your counter or silicone baking mat with flour. Then coat one of the dough balls generously with flour (keeping other ball covered with plastic). Use fingertips to gently flatten dough into 8-inch disk, leaving 1 inch of outer edge slightly thicker than the center. Using hands, gently stretch disk into 12-unch round, working along the edges and giving quarter turns. FEEL FREE TO PICK UP AND GENTLY TOSS, PUTTING YOUR KNUCKLES UNDER THE DOUGH TO STRETCH. Transfer to pizza peelcovered in corn-meal and stretch to 13 inches. You’ll notice the crust start to bubble as you are stretching the dough. I guess that’s a sign that they got the recipe right!! 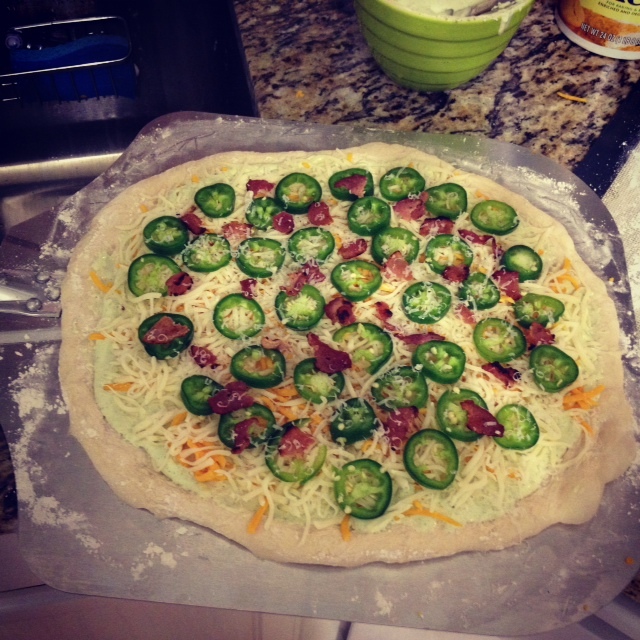 Spread the 6-7 TBSP cream-cheese jalapeno ranch dressing over the dough. Bake in a preheated 500F oven until golden brown on top, about 5-10 minutes (closer to 12 minutes if you are baking at 450). Let cool on wire rack for 5 minutes before slicing and serving! Happy Cooking!! Please email me with any questions. Reading the recipe is WAY better straight out of the book, I highly recommend buying a copy! This morning Kirk told me he was craving chicken, so we pull one of our 2-packs of frozen chicken breasts out of the freezer and put it into the fridge for thawing (so much faster if you put it in a bowl of water!!). 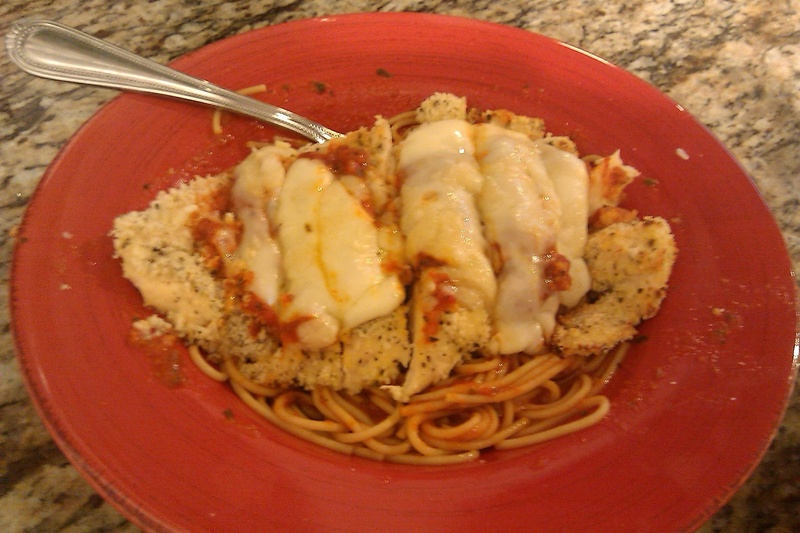 We decided on Chicken Parmesan after work, but both of us wanted a slightly healthier version. After some quick googling, here is what we came up with! Pound chicken breasts out on a cutting board to 1/4-1/2″ thickness. To do this, place the chicken between two sheets of plastic wrap and get out some aggression with your meat hammer 🙂 Don’t be shy!! Trim any extra fat off with kitchen shears. Place in a shallow baking dish. Using a fork or whisk, mix 2.5 Tbsp of the dry buttermilk with 2/3 cup water. Pour over the chicken and make sure it is well covered. You can do this the night before or 30 minutes before cooking (I did the later bc I didn’t have the recipe picked out ahead of time). Fill a large pot with water and bring water to boil over high heat. Add a tsp or two of salt to help get the water going (and to add flavor). Cover with lid until boiling. In another shallow bowl or baking dish, mix the panko crumbs, basil, oregano and garlic powder. Set aside. I used a 9×9 dish. In another shallow bowl or baking dish, whisk an egg with a fork and pour a little of the buttermilk mixture from the chicken dish into the egg (~ Tbsp or 2). Don’t worry, we’re going to be dipping the raw egg in this mixture, so we’re not contaminating anything. Line a baking sheet with foil and spray with pam. Set your prepping bowls & sheet in a row: soaking chicken, egg wash, crumbs, baking sheet. Pull the chicken out, shake off a little, dip in egg wash (both sides), dip in crumbs and then put on sheet. Spray with a little pam (very little, just makes it a tad crispy) and pop in the oven. Set timer for 15 minutes. Add the pasta to the boiling water. Cook however long you want! I cooked my for quite a while and then just turned off the heat and let it sit in the hot water until I was ready to drain. Shred the parmesan. Set aside. When the timer goes off, pull out the chicken and check it. I used a thermometer and stuck it in the side to make sure it was 170 degrees. You could also cut it or poke it to make sure the juices are running clear. Laddle a few spoonfuls of sauce on top of the chicken and then top with mozzarella and parmesan. Turn the broiler on high and pop back in the oven with the door slightly ajar. Drain pasta and the dole out between two bowls (or more). Heat 1 cup of marinara sauce int he microwave and then mix with the pasta in the bowls. Pull out the chicken and place on top…. voila! Optional: slice the chicken into strips before putting on the individual dish. Makes it much more manageable. PS – Kirk ate all of what I gave him, but I only ate half of mine. Totally depends on how much your guests eat, but this recipe is made for 2-3 people. If you are serving with salad or other side items, you could totally stretch it to at least 4 people. If at first you don’t succeed….doctor it up!! 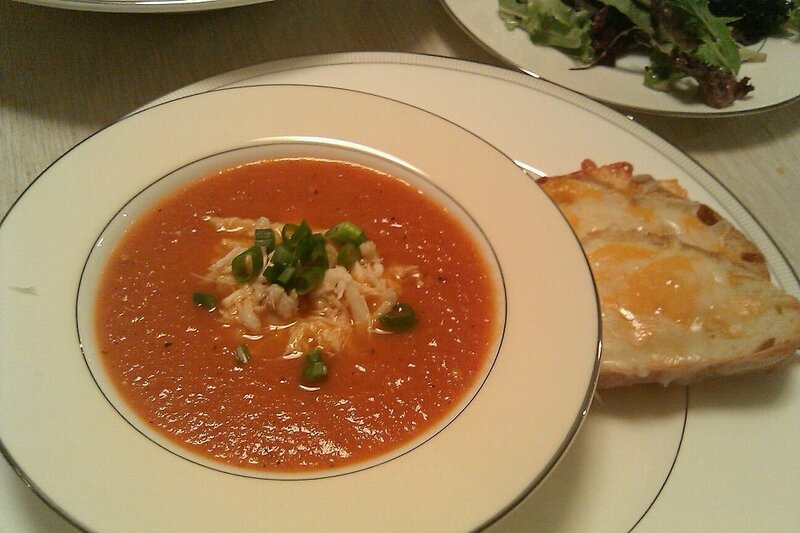 So, I made a new soup recipe on Friday night and was super stoked about it…. only to be underwhelmed (sorry Sami and Carp..). It wasn’t horrible, and personally I thought it looked very pretty, but the taste was just off. 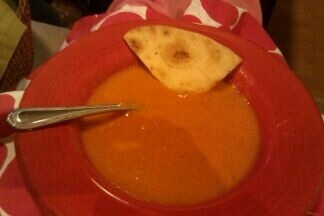 It didn’t have any heartiness to it, and the finish was a little bland (albeit nice and spicy). Instead of tossing it out, Kirk and I decided we’d give it another go with a few tweaks! To doctor it up, I added some potatoes for heartiness and vegetable broth for flavor. Then I finished it with a little salt and soy milk. Voila! Nice smooth taste, still spicy and definitely more satisfying than the previous version. We omitted the crab this time too since it didn’t really do anything last time… and I used it all in the crab cakes I made last night 🙂 Much better use of the precious meat! 1. In a large pot, heat EVOO on medium. Sautee garlic, onion and red pepper flakes until fragrant and soft (5 minutes), stirring every now and then to make sure it doesn’t burn. 2. Add the broth, potatoes, peppers, tomatoes and salt into the pot. Bring to a boil, cover and turn down to med-low for 15 minutes. Using a fork, check to see if the potatoes are soft. If so, you’re ready to puree the soup! 3. Lower your immersion blender below the liquid surface and blend away. Or, if you are using a traditional blender – carefully pour the mixture into the blender and puree! This soup pairs great with toasted Naan bread or toasted cheesy french bread.